The Providence Marathon was run on a gloomy cool day. The race has some things to learn, like 15 portapotties for 3000 marathoners and half marathoners isn’t adequate. The portapotty line was very long to say the least but it gave us a chance to spot Barry and Gary Gilbert going by, and also allowed us to mingle with other runners, most notably the girl in front of us who was very friendly, talkative and nice. Still though the race started late as the portapotty line kept growing and growing. I shed my rain gear (a trash bag) minutes before the start, right before the downpour that would soak us before sending us on our way. Recovering from a pulled calf, I was anxious to see how far I could get into the run pain-free. As we headed up a hill on Harborside Blvd to turn onto Narragansett Blvd it tightened and began to ache, that was 0.1 miles into the race. It would effect my run for the next 26.1 miles. Naragansett Blvd turned into Allens Ave and provided some interesting obstacles, many construction barrels, old railroad tracks, unidentifiable road kill, and several billboards for gentlemen’s club… I learned that ‘Desire’ is not just a song lyric, not just something that will help you get to the finish line of a marathon, its also a gentlemens club in the Providence area. As we continued along, skirting the edge of downtown Providence, we headed into nicer looking residential neighborhoods and made our way to the first spot Rick would be providing invaluable and outstanding roadside support for our group. I pulled in, quickly ditched my jacket, and noticed Nick was stopped there doing the same. This gave me some pause, Nick is running a half, I’m running the full, why am I passing him? With an “I’ll catch you Carson” he jumped back in the race behind me. Shortly after, along the shore of the Seekonk River we hit the first clock on the course at mile 5, 46 minutes, about 9 minute miles, reasonable. Making our way along Blackstone Blvd, passed the 23 mile mark, then the 6 mile mark I would be here again in around 3 hours… that wasn’t inspirational by any means. But continuing on through hills, hills, and more hills, we came to the spot where the half turned left and I turned right… no Nick, what am I doing? Crossing over the Seekonk River into East Providence, passed Linwood Ave (a familiar name to me, but I was not close to home), I hit the next clock at the 10 mile mark, 1:24. I had sped up, that’s what I’m doing, which at the time didn’t seem bad but I would pay for it later. Along Roger Williams Ave I believe, we ran into Rick again, and a quick cup of Gatorade and I was off. Along Pawtucket Ave I rememembered I wanted to drop my hat off with Rick as the rain had stayed away since the start and I was starting to get hot, but I had missed my opportunity. After passing the clock at the half (1:54) I decided to say farewell to my black nike running hat, good bye cap, you’ve served me well. The second half of the race begins with a long, seeming constant incline. Although I wouldn’t say it was a hill it was doing a number on my calf though as each step needed a little extra push. I could feel little pinches in the muscle fibers along the inside of my calf… that didn’t strike me as a good thing. Mile 15 I came through at about 2:09, still a decent pace for me. As the climb continues I ran into my favorite site of the run, Judi! She seemed as happy to see me as I was to see her, bounding ahead of me along the road to take pictures yelling “These better end up in the MRC video!”. We’ll see. With an extra charge from Judi I finished off the climb with a quick turn onto a bike path along the river. From East Providence along the bike path you could see the dome of the RI State House in the distance, seemingly 50 miles away but only a 9 mile run from here. As the long waterstopless bike path stretched on through mile 17, 18, and 19 the state house looked just as far away, the Providence Marathon version of the Citgo sign. I passed the 20 mile mark shortly after the 3 hour mark, slowing down, and hurting more. Up a series of hilly streets and I came to Rick’s final water stop. A Snickers and water and I was heading for the home stretch. The final stretch was hilly and draining. Hours of running with a slight limp were adding up and exhaustion had set in. I slowed, and slowed, and slowed as mile 21 turned into 22, then mile 22, struggling into the final excrutiating hill at mile 24. I felt a hand on my shoulder, Mike York. I told him how I was doing, he told me how he was doing, neither report was good. Rick compared this hill to the one on the back side of Spot Pond, dubbed Slacker’s Hill in runs earlier this year. I finally gave in on Slacker’s Hill south thinking of Joanne and Sue as I walked, they would approve of this little break. The upper portion of my left leg finally decided to speak up after hours of making up for the lower part of my right leg, and it was going on strike. As I watched Mike pull ahead a little boy with a lisp offered me a cup with a few Thweedith Fith. I don’t know what I was lacking but Thweedith Fith replenished it! I started back up and endured the pounding as we came back downhill from the heights we had climbed all day, entering downtown Providence towards the finish. Mike kept a consistent 100 yards in front of me, not knowing he was actually dragging the two of us towards the end. As we twisted through the cobblestoned side streets of downtown Providence I was passed by a woman who uttered “where almost there, keep it up” as she pulled next to me. I looked at her and said “Portapotty Girl!” and she said “It’s you, Portapotty Guy!” Mike and I started our day right behind her in the bathroom line and we both finished our day right behind her at the finish line. So that was Providence. Another stop complete on my trip around New England marathons. 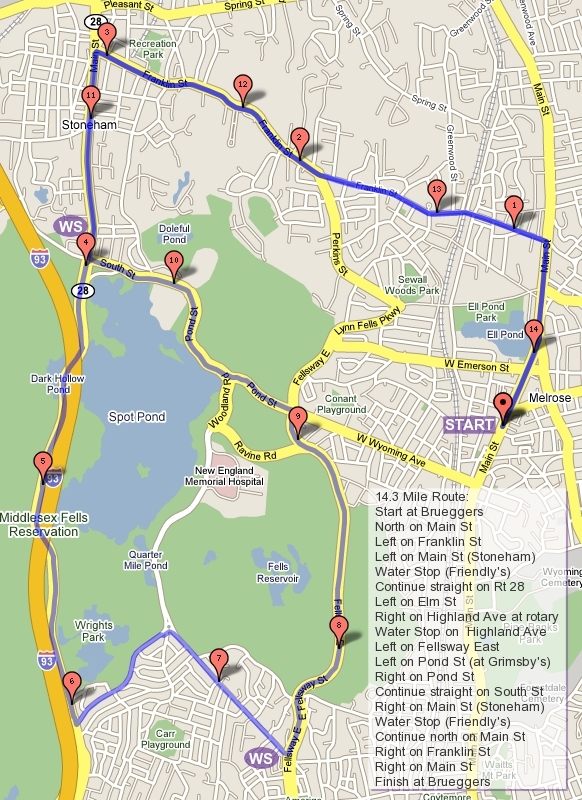 This week some of our Sunday Long Run regulars will be heading down to Providence to run in the inauguralÂ Rhode Races. Pam, Lois, Nancy, Mike, Barry, Ron,Â and I will be running the marathon. Nick will be doing the half. Any one else running the half? For those staying back looking for a run to do, I’ll start posting some “Maintaining Routes”, middle distance runs that help keep the miles up during the weeks in between training sessions. If people want to meet either post here or the forum, pick a route, decide if you want to organize a water stop and go for it! The “Maintaining Routes” are posted as links on the panel to the right. So far I’ve just posted Breakheart but there will be routes posted to Lake Quannapowitt, Spot Pond, and Horn Pond over time.